Aristotle emphasizes that it is the ‘sequence of events’ not the end result that is important : in my terms he is concerned with an event-chain as an unfolding sequence rather than with the last event of this chain. What makes a good plot in both ancient myth and current Hollywood movies, is not the conclusion which was, in the case of myth, generally known by the audience (fall of Troy) and, in the case of action movies, predictable (the hero generally survives). It is the unravelling, the manner in which the action unfolds that counts. Aristotle believed (rightly) that drama should concern itself with what we would today call archetypal (human) situations rather than actual events which, he says, are the subject of history rather than ‘poetry’ — by ‘poetry’ we must understand poetic drama. Such archetypal plots (sequences of events) have a feeling of inner necessity about them and this makes them compelling — compelling to watch (because we identify ourselves in what is represented on the stage) but, more significantly, compelling for the characters themselves who are enmeshed in sequences of events over which they have, as the drama progresses, less and less control. This is precisely the feature of event-chains that, in the jargon of Ultimate Event Theory, I call ‘dominance’. The archetypal stories of Adam and Eve, the homecoming of Ulysses and so on have a ‘power’ which other stories, real or imagined, lack. In terms of Eventrics, they have more ‘dominance’, an event-chain’s dominance being its capacity to make other event-chains conform to its own pattern. 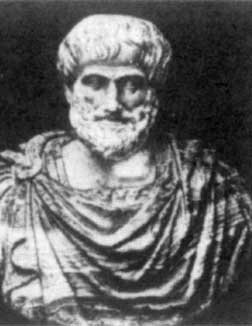 Aristotle, interestingly, believes that it is more important that a certain sequence of events in a drama should be ‘probable’, i.e. ‘contain an inner necessity’, than that it should have really taken place. Rather than fiction being justified because it is ‘plausible’ (could have happened), it is to be justified with regard to basic event-chains because the latter have (in my terms) more ‘dominance’ even though they never took place. Inasmuch as the ‘poet’ (read dramatist) deals at all with actual past or present occurrences, he should concentrate on those which possess this extra potency which most mundane events lack. A few historical sequences of events do indeed seem to have a ‘rightness’ about them which is extremely satisfying and which is much more typical of myth than everyday reality. The true story of Antony and Cleopatra attains the universality of myth, as does, nearer our own time, the career of Rommel or indeed that of Hitler himself. This ‘rightness’ is an aesthetic (or perhaps logical?) criterion rather than a moral one though we do have the revealing concept of ‘poetic justice’. It seems ‘right’ in a sort of cosmic sense that Macbeth should be caught in his own noose and he even shares this view himself, hence his final speech (“Life’s but a walking shadow…..” &c.). It is also ‘right’ that Lear should pay for his folly and insupportable treatment of Cordelia, that Mark Antony should commit suicide &c. &c. It was ‘right’ in a sense that goes beyond law and ethics that all the Nazi leaders except Speer should have either committed suicide or been executed — and right that Speer should not have been executed since he was the only one of the prisoners at Nuremburg who pleaded guilty. Within Eventrics, there is the notion of a secondary, manufactured domain called the Manifest Non-Occurrent, which is composed, not of actual events,. but of event-schemas which have spontaneously evolved out of myriads of actual events. These schemas are subsequently able to influence and even dictate much of what goes on in the physical world. We are familiar with the idea of Jungian and Freudian archetypes but most of the so-called ‘laws of nature’ are, at bottom, of the same character, that is, they are ‘schemas’ and not eternal ‘laws’. In the past scientists thought that physical ‘laws’ were laid down by God and so could not be changed and, moreover, that they had no capacity themselves to evolve. But there is no need to believe this today when most scientists have dispensed with the necessity of a lawgiver. Of all the so-called laws, the most basic would seem to be arithmetic (rather than physical) laws : in this respect Pythagoras was not far from the truth. A universe could function perfectly well with quite different values for many constants (and maybe does so somewhere at this moment) but it is hard to imagine any universe where the basic properties of the natural numbers were not upheld. Archetypal event-chains do not seem to evolve if left to themselves. If and when they re-emerge, they do so in their previous form and affect contemporary people in much the same way as they affected people who lived hundreds or thousands of years earlier. It is, according to Eventrics, not gods, heroes or even ‘great men’ who drive history but neither is it impersonal deterministic ‘physical laws’, it is dominant event-chains. These schemas are themselves in many cases the result of human effort but, once fully formed, they exert a powerful influence over the subsequent behaviour of living people. In this sense, one can say they are ‘alive’, if, by being alive we mean exerting an influence, even they ‘reproduce’ in the sense of producing copies of themselves. Classic tragic sequences of events produce actual tragedies, or at least the mould into which occurring tragedies tend to fall. But the event schemas are not alive in the sense of being able to change into something else. It is not surprising that Plato, a rational visionary, considered his ‘Ideas’ to be fixed and unchanging. But he was wrong on two counts, firstly because he concentrated his attention on static forms rather than on sequences of events (Aristotle’s plots) and, secondly, because these archetypal schemas can lose their effectiveness as and when actual events depart more and more from the basic mould. Successful men and women in politics, business, warfare and most active professions align themselves, consciously or unconsciously, on already existing event-chains which they bring back to life, as it were. This is what Hitler and the Nazis did with phenomenal success, resurrecting all sorts of powerful ancient symbols and battle schemas, even to the extent of facilitating their own destruction since in Norse mythology the gods are not immortal and all-powerful but actually die at Ragnarök, the Twilight of the Gods.